A loft conversion with dormer provides significantly more head space and gives you more freedom in your newly created space. Dormer loft conversions are one of the most popular enquiries we receive, and with the benefits they offer it’s not surprising that many people choose them! While a standard loft conversion just optimises your roof space, a loft conversion with dormer extends out, parallel to the floor, into a window to provide much more light and standing space. Dormer loft conversions are perfect for those that want to make the most of the space in their loft. 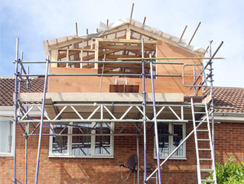 The most common type of dormer loft conversion in the UK is the standard flat roof dormer. Not only is this the cheapest dormer to build, it also offers the largest amount of internal space so in the majority of cases this is the type of dormer loft conversion we would recommend to our customers. Shed dormers are very similar but have a slanted roof at a shallower angle to the main roof. This type of dormer is usually fitted on gable roofs, although gable fronted dormers are available. However these generally don’t offer too much internal space. Dormer conversions allow you to benefit from much more standing room, especially flat roof dormers. Because dormer loft conversions offer more room for windows, your attic space will be filled with light and look much bigger and more welcoming. Whatever you have planned for your newly found space, a loft conversion with dormer allows you to truly make the most of it!